Suppose you've got a GIF image from somewhere but you want to extract a single image i.e non-animated image of that particular image. You're worrying about that because you still don't know how i can extract or take a single picture from the animated image? If this is the case with you then you don't worry because here in this post, we will be sharing some best and free online tools that let you extract pictures from a GIF animated image just in few clicks. There are lots of web-apps and tools that can be used for this task we came with the best of those at all. Before we start getting with the entire Gif Exploder tools, I would like to recommend some other free online tools that we already shared on our blog before, and we're getting to know that these are helpful for our readers. Now let have a look at our today's collection of the best tools that let you explode a gif image into the frames. Tip: You can also use online photoshop. Gif-expode is one of the most popular on the web, has a simple to use and user-friendly interface that "expode" your uploaded gif photos into the actual frames of which the image is made. In order to use this website for your purpose, you've to land on their website. After landing there, you see two options at the right side i.e 'From the web' and that is 'From your computer'. You know what it mean! After uploading the gif image by one of the option, you'll get all the separated frames of that image so right click on one by one to save it to your computer. It is more similar as the above one. A user-friendly, fast, free and easy-to-use tool. 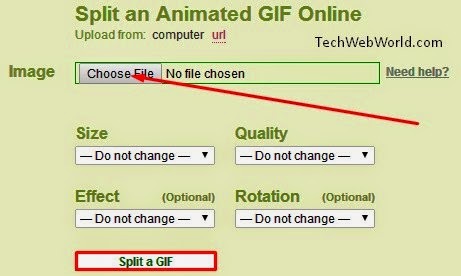 But unlike the above one, it do not give you an option to explode a gif into separate images by uploading from the web. So that you've only one option available there that is to upload a gif from your computer to extract pictures from. There at picasion, you can split your animated image into separated image what it actually made of. It gives you some more advanced options i.e Change the size, quality, add an affect, rotation etc. You can either upload a gif image from your computer or by entering url. Gifmaker can be used to explode a gif into separate frames. Using this for the particular task is very easy and requires a click on "upload image" button to extract pictures from the gif image. So friends, in today's post we come once again with some online photo editing tools which is all about GIF images i.e to extract pictures from a gif. I hope you liked this post and was helpful for you. Note that don't forget to share this post with your friends on facebook, twitter and other social networks you've account. Have anything to say about this post? Feel free to share your views!! !